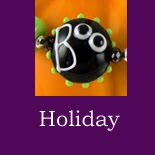 As promised, I'm letting you know that Halloween jewelry is being added to the web site today! And you will soon find 11 pairs of candy corn earrings, three sets of adorable monster earrings (with eyes that glow in the dark! ), and two very special bracelets. All we be loaded today, so keep checking -- and once they're gone, they're gone! Visit www.lorianderson.net for more handmade jewelry for every occasion. i love the little ghosts! they're so cute!! You are so talented; your lampwork is beautiful! I saw your candy corn earrings on FaceBook. Very clever! And cute! These are wonderful! I bet they won't be around long at all! So SUPER COOL!!! The little ghosts are just adorable! The lampwork is fantastic! 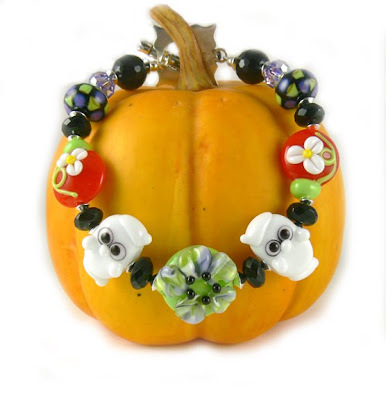 You're so great with seasonal jewelry. I love that cute frog in the "Witches Brew" bracelet! Win a Bead a Day Calendar!